As Christmas approaching, I think this would be a great dessert whether you're hosting or going to a house party. 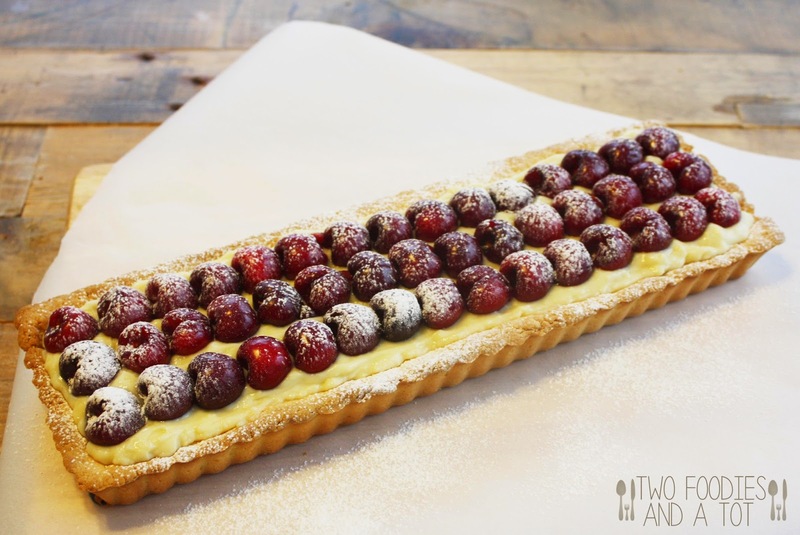 As I mentioned in my previous post, I made this for Thanksgiving as my nephew loves fruit tart and recently I found out that he goes crazy for cherries. I know. This dessert doesn't scream Thanksgiving. 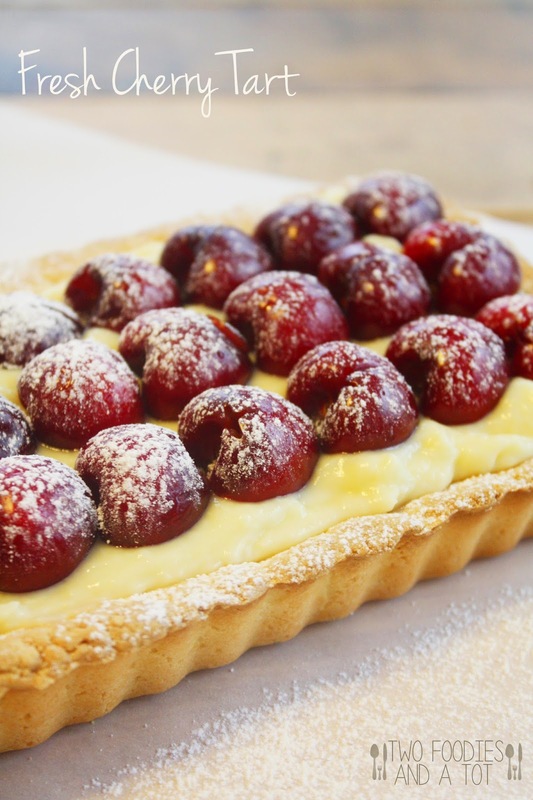 When I make fresh fruit tart, I usually make it with variety of berries but since I know what he goes crazy for, why not just make it with cherries? Since I rarely cook or bake with cherries, I didn't own a cherry pitter. As soon as these cute little guys comes in my hand, I would just devour them so I didn't even need a pitter. But since I had to keep them in pretty shapes for the tart, I decided to invest in one. And I am truly impressed with the results! I got one that pits 4 cherries at a time and how does it get the seeds so perfectly every time? Well..you can obviously tell that I am new to this and enjoyed the pitting. It was actually pretty enjoyable. Something that listens and follows my direction without my yelling involved. Because I took pictures before I brought them to dinner, I don't have any picture of a cut piece. I didn't even have a chance to save a piece. It was destroyed in minutes. Which is a good sign. Recipe makes a lot more custard than you'd need for this tart and you can halve the recipe but I just make the whole portion and save some. It's great with fruits -of course- and warm brioche buns. My gosh, custard cream with a soft bun? Brings back my childhood memories. I have a holiday party this weekend and this will be served as well since it's very festive and so pretty! 1. Make tart shell - In a food processor, pulse butter and confectioner's sugar for a few minutes until fluffy. Add egg and salt and process for a minute or so. Add flour and process for a few seconds. Dump the dough on the surface and form a dough. 2. Roll it out evenly and put it in a tart pan. If you see some gap here and there, just use the dough scraps and press it down to patch it up. Prick the bottom with a fork and freeze for 15 minutes. Bake at 350F for 30-40 minutes or until golden brown. If you see the center puffing up a little while baking, you can use a spatula to gently press it down and continue to bake. 3. Make custard - In a heavy saucepan, mix milk and 1/4 cup sugar and bring it to a boil over medium heat. 4. In another bowl, stir together egg yolks and egg and add remaining sugar and corn starch. Stir them together until smooth. 5. When the milk is ready, add milk to the egg mixture in a thin stream while stirring constantly so eggs don't cook. Return the mixture to the pan and slowly bring it to a boil. Stirring constantly. When it comes to a boil and thickens, stir in vanilla and butter and mix until well blended. Pour into a heat proof bowl and cover with plastic wrap directly on the surface to prevent a skin forming. Refrigerate until chilled and ready to use. 6. Assemble the tart. Spread the custard evenly in the tart shell(You won't need all of it). Top with pitted cherries and keep in the fridge until serving. Dust with confectioner's sugar before serving.